Visual Business Intelligence – Control vs. the Illusion of Control: Which Works for You? Control vs. the Illusion of Control: Which Works for You? People who don’t know how to manage performance or merely don’t care tend to prefer dashboards (monitoring displays) that say little and do so poorly. This way they’re never told anything they don’t understand; they’re never forced to get off their butts; they’re never faced with a decision they can’t or don’t wish to handle. For such people, the illusion of control is not only sufficient, it’s preferred over real control. Most dashboard gauges are designed to look just like speedometers, fuel gauges, temperature gauges, etc., down to the annoying glare of light on glass. Do you know how much research went into determining that idiot lights and gauges that look just like those in our cars are the best way to display information on a dashboard for monitoring your organization’s performance? The answer is zilch; none whatsoever. Back in the beginning when we started calling computer-based monitoring displays dashboards, someone had the bright idea of making display widgets that looked like those in cars. This is an example of taking a metaphor too literally. In the early days of cars, some of them included holders for horse whips, even though they were no longer needed. This seems absurd to us now, but it’s no more absurd than assuming that information displays for monitoring the performance of your business should look like gauges on a car. The part of the “dashboard” metaphor that works is the similarity in function between car dashboard gauges, which we use to monitor information about the car and our driving, and monitoring dashboards, which we use to monitor information about the organization’s performance. It is meaningless and downright absurd to stretch the metaphor any further. Despite being lauded for design, Apple is the reigning champion in this field, producing a conga line of skeuomorphs that are by turns baffling and annoying. Its iPhone app, Find My Friends, includes astonishingly ugly, faux stitched leather that wastes screen space. On the new iCal for the Macintosh, things are odder yet: when you page forward, the sheet for the previous month rips off and floats away, an animation so artless you’d swear it was designed personally by Bill Gates. And if you really need to flip paper pages on your calendar? Buy a handmade one—and hey, get some nice-quality pencils. Let paper work like paper and screens like screens. Skeuomorphs aren’t all bad. There are times when they can be used, as N. Katherine Hayles explains, as “threshold devices, smoothing the transition between one conceptual constellation and another.” You might argue that by making dashboard gauges look like those on cars, we’re making it easy for people to use performance monitoring displays. It is certainly true that experience driving a car has already taught you how to read them. That would be a good argument if it took days or even hours to learn how to read more informative forms of display, but this is hardly the case. For example, a bullet graph, which was specifically designed for performance monitoring dashboards takes approximately one minute to learn how to read. One minute of learning is a small price to pay for a lifetime of better information more efficiently acquired. If you’re good at your job and care about it, you want to be fully informed. You’re not an idiot, so don’t put up with dashboards that treat you like one. Demand the information that you need displayed to the level of your ability. It seems there is another reason for these displays, particularly the shiny, realistic-looking gauges: hubris. Some designers just can’t resist the opportunity – it’s like they are compelled to make their graphics look as fancy as possible. Isn’t the point that car dashboards are designed for continuous monitoring where the drivers actual focus is going to be on the road. That is they are there to be glanced at periodically. The driver has little to no opportunity for absorbing any more information. BI Dashboard displays are trying to convey something entirely different, often the state of a business. The need for Bi dashboards is to maximise information not minimise it. Of course a driver’s agenda provides the context for evaluating dash info. Long ago, when my kids were new drivers I told them the important gauges were Temp and Oil Pressure— neglecting to monitor Speed or Fuel could get you a ticket or make you a pedestrian… -but neglecting those could make you a car buyer. I still don’t agree with the concept that gauges are bad things. It has nothing to do with being an idiot or if your audience is an idiot. If done properly, it is the most basic fundamental representation of a metric against a scale with optional qualitative representations illustrated by colours. I understand that gloss and making gauges and simple indicators resemble life like objects or selecting colours or scales that are visually distracting is not a good practice but the same can be said to charts and tables. Tufte’s work is riddled with data representations which neither resemble a chart or table, and some that do resemble a gauge. 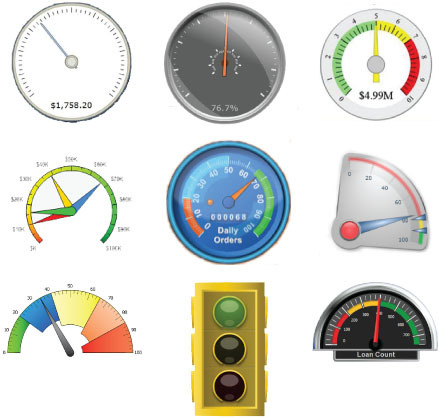 Are you stating that gauges, being a dashboard metaphor or not, is simply not a proper tool of data visualization and should be banished much like pie charts according to your discipline? The concept of gauges is not a bad thing; it is the ineffective design of most gauges that I’m criticizing. Yes, I’m saying that most of the gauges that are available in dashboard products should be banished. Why? Because they display data poorly. If you disagree, I invite you to provide an example of a gauge, other than a bullet graph, that you believe is effective, and we’ll discuss its merits. I don’t think he was necessarily calling anyone an idiot for using gauges – he was talking about idiot lights (see http://en.wikipedia.org/wiki/Idiot_light, the first paragraph specifically). Stephen’s use of the term “idiot light” as opposed to “tell-tale” conveys to me his frustration with the oversimplification of useful data, not that he thinks people who use gauges are idiots. Stephen is right to direct his last sentence to the users of a dashboard, rather than its designer. Designer hubris is doubtless a factor, but I think gauges persist mainly because clients like them. Even generally savvy clients can fall into the trap of viewing the actual visualizations as “creative,” to be critiqued on visual appeal, in a separate meeting from discussing the decisions that the data will inform. Dashboard gauges along with other indicators can appear to be in conflict because of the perceptual confusion of the quasi analogue “speedometer” alongside the digital-ness of a column chart for example. All of the examples Stephen has posted say both too much and too little all at the same time. The graphics pros and headline writers I know and know about actually like those inferences and undertones. I’m glad my car’s tachometer lets me know that being too “successful” i.e. REALLY high revs, is dangerous without me having to second guess what a variety of colours and other embellishments are for. Simple charts can be weird and ambiguous too especially in this circumstance: http://www.informationisbeautiful.net/2012/lord-of-the-rings-demographics-visualized/?utm_source=feedburner&utm_medium=feed&utm_campaign=Feed%3A+InformationIsBeautiful+%28Information+Is+Beautiful%29&utm_content=Google+Reader. The original post has a pie chart added to make something clearer, though I’m still wondering how even in LOTR a sizeable proportion of the men are female. Everyone has a friend that loves to talk. They’ll babble and babble (and if she’s hot we’ll probably let her babble some more) and it takes them a lot of verbal noise to say something very simple. That’s what gauges are like. They take up huge amounts of pixel/dashboard space (the “babble” or noise) to say something very simple (the signal). Although I prefer linear gauges (as well as its extended version: bullet graph) as I find the circular/angular ones more difficult to read and not as effective if the scale is not a %. If many of the recipients of reports/dashboards want, enjoy and like gauges, shouldn’t we cater to them and try to improve and innovate visualization components. And if so, why not work with something that is widely accepted and requested such as a gauge? The challenge that I put forward to Stephen (and anyone else) is how can we provide a radial gauge to the users that meets both the “consumer” need to have a gauge and that is designed in such a way that displays data beautifully. In the realm of data visualization, we face many challenges that are worth pursuing. Creating an effective radial gauge is not one of them. It is a fool’s errand. Do I strike you as a fool?